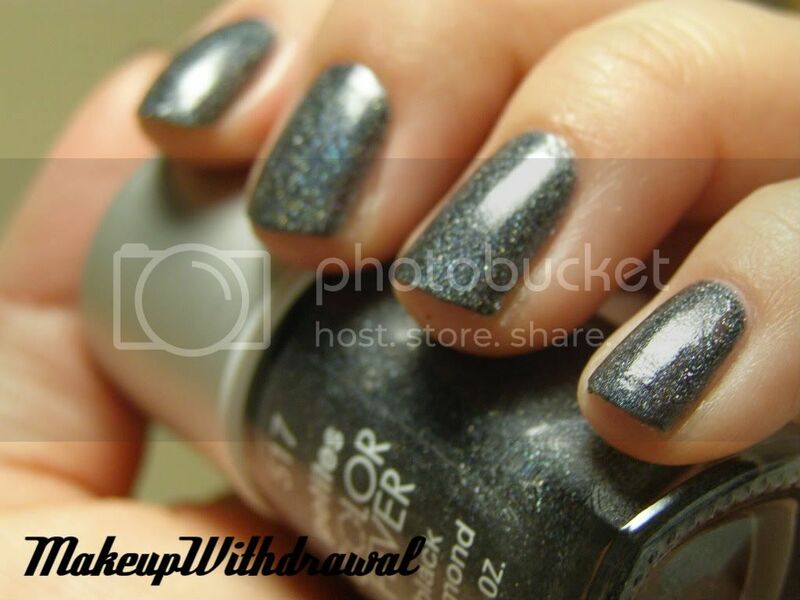 Did you know that there were drug store holo polishes besides the Milani 3D line? No? I didn't either, until I went to Rite Aid today. I took a closer look at the Petites polishes. Have you ever noticed these? The reason why I always passed by them without a second thought is because they're really expensive, ounce for ounce. How expensive? The Petites Color Fever polishes are .25oz and retail for $3.99. Compare that to China Glaze, OPI and Color Club- all of which are .5oz and for which I pay $2.50-$6.00 for- the Petites are way more costly! But today, while picking up Vapour Rub for Mr. MakeupWithdrawal (sick as a dog, he is), I looked at each polish carefully because they were BOGO1/2 Off and noticed that two of the shades from the line were holos! Yes! Glorious, glorious holos. 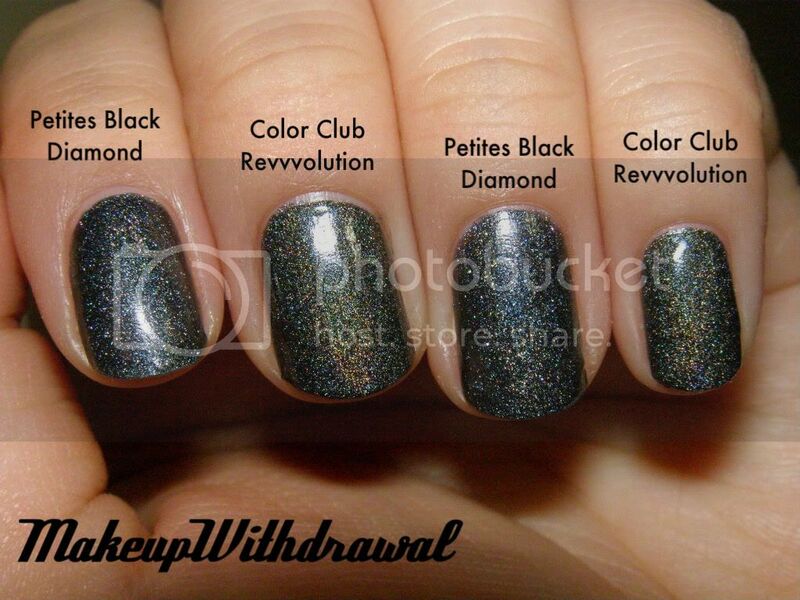 Black Diamond is a dark charcoal holo. The particle size of the holo is bigger than that of Color Club Revvvolution, so it's a bit more subdued of a holo and more scattered. I liked that it was wearable in two coats. 3x of each. Indoors, flash. Indoors, flash. 3x Fairy Pink. See how you can still kinda see my smile lines? Fairy Pink is this GORGEOUS light pinky-lilac holo. Not only is it a holo, but unlike any other one that I've ever seen, it also has this opalescent effect. It's quite sheer though, to make it opaque I needed four coats. However, I did find that you could layer this shade over other polishes for a very sparkly set of nails. The particle size of Fairy Pink is smaller than Color Club holos, and smaller than Black Diamond. I think that if you have Diamond Cosmetics Chainmail Charm, Color Club Revvvolution or the holo OPI My Private Jet, you don't really need the Petites Color Fever Black Diamond. However, if you are an admirer of beautiful, unique pink polishes I think that Fairy Pink is a MUST. I'm not even partial to pink, but I have to admit that it's very gorgeous to look at. However, definitely wait for a BOGO1/2 Off or better sale to pick one up! Have you tried any Petites polishes?